Replace your innefficient incandescent R20 Watt light bulb, to GBLs R20 LED Lamp. Damp Location Rated and dimmable using only 7 Watts. This bulb has a small package with a bright kick. Stocked in Beautiful British Columbia Canada. 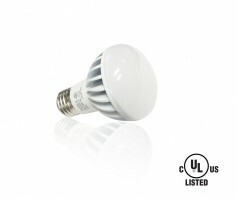 cULus Listed LED R20 or BR20 LED Replacement bulb.